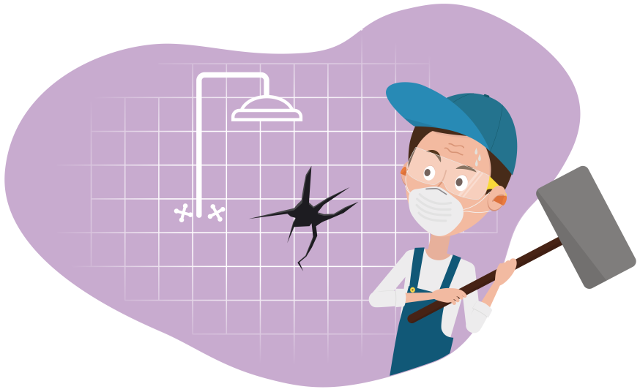 Are you looking for some detailed actionable advice from a remodelling expert about demolishing your bathroom shower? If so, you won’t be disappointed with this post. If you want to do this job responsibly, you and / or your contractor MUST wear the proper gloves, ear, eye, and lung protection and the proper footwear during every stage of the demo AND the entire rebuild. The demolition stage is especially unpredictable & dangerous. Make sure you don’t take any chances with your personal health and safety. Take things slow, be very careful, and follow my advice ! The tub or shower base must be first disconnected from the drainage line before these items can be removed and disposed of. For a bathtub, it usually involves unscrewing the drain base. With older tubs, especially the steel ones, this can be challenging since the tub drain flange is almost always rusted. Insert a pry bar or a pair of heavy duty pliers onto the drain opening to get some leverage, and try to unscrew the drain base from the tub drain flange. If this does not work, I usually use a piece of flat steel stock (1/8″ thick, 1 1/2″ – 2″ wide, 6″ long) and hammer it ruthlessly into the drain hole. Just be sure that it’s not too wide to distort the tub drain flange (making the situation worse!). Then use a pair of channel lock pliers or long vice grips to clamp onto the metal bar and turn. This method has rarely failed me. If it fails to unscrew, unfortunately your only option is to cut out a small section of the tub (around the drain) to free the whole drain assembly (not fun with a steel tub). 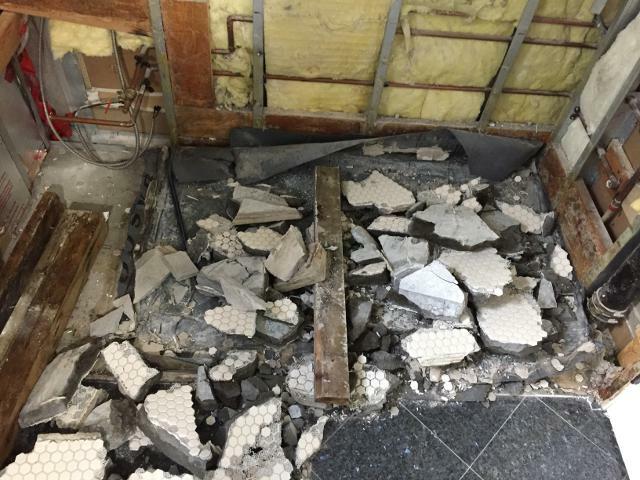 If you decide to keep the tub and tile around it, you are going to have to be very careful to cover and protect the tub surface before demolition. I would first suggest using masking tape to cover the entire tub rim (see images). Then tape a layer of cardboard onto the tub rim. Then place a piece of 5/8″ plywood cut to size, on the tub rim, covering the entire tub opening. Also tape all around the perimeter of the plywood to ensure that nothing falls in the gap around the plywood sheet. 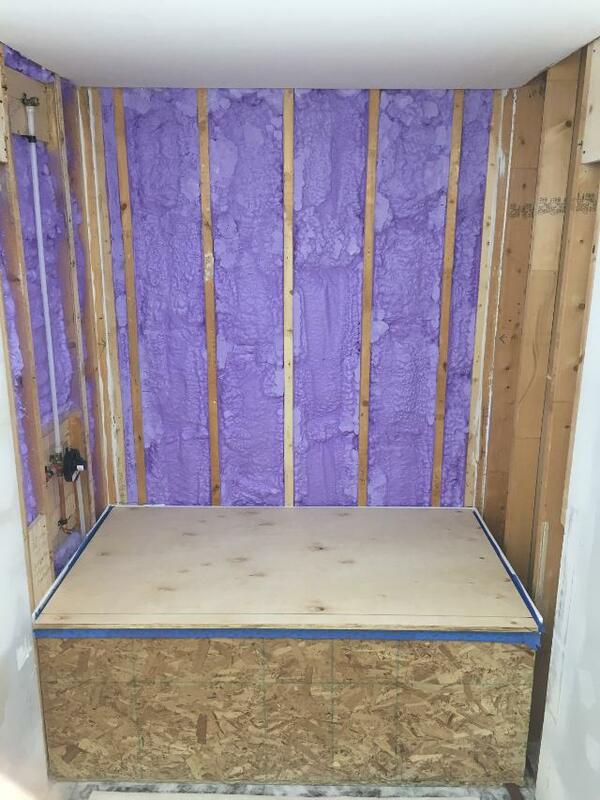 The plywood will protect the tub and provide a work surface for the demo, framing prep, and backer board install. I know it seems like a lot of hassle but believe me, you will appreciate it many times over as you work through the different stages of your shower remodel project. It only takes one piece of old tile falling on the tub surface during demo, to cause irreparable damage (along with the inevitable cursing, sadness and regret, of course). Removing the tub is a lot easier after the wall tiles are demolished because the perimeter tiling flange remains under the wall tiles. Even if you remove the bottom row of tiles, the entire tile assembly still gets in your way if you attempt to remove the tub in one piece. It’s a huge headache. It’s the same if the shower base is acrylic/ fiberglass. It’s easier if you delay it’s removal until after the shower wall tiles are gone. Removal of the shower pan (shower base) is the first step that I take in any shower stall remodel if the shower pan is made of concrete. Most old school concrete shower bases are poured (or dry pack) bases that were applied over a rubber liner that lays over the concrete or plywood subfloor. Since you can easily get a prybar underneath these liners, you can pry the entire shower base up off the subfloor. Proceed to pry the liner & base high enough to wedge a piece of scrap wood underneath. Then smash the shower base with a hammer anywhere above your spacer (I do like smashing things). The space created by the scrap wood allows you to easily crack the brittle concrete into bits. The shower base material will be immensely heavy so you will have to proceed with this technique until you smash it into pieces that are light and small enough to bag and dispose of. After cleanup, the shower pan liner will be exposed so you can begin cutting it away with a utility knife. If you like, you can try to use the liner to get under the tile and backer board with a pry bar. If there is framing (backing) between the studs, you can sometimes use this to easily pry off the bottom section of tile and backer board. Sometimes it makes it easier to remove this lower section of wall tile, and sometimes it just crumbles to bits and creates a huge mess. You can try it and judge for yourself if it’s worth doing. You may have noticed that I neglected the shower drain removal procedure. I did this because in my experience, it’s far too time consuming and difficult to figure out a way to disassemble any walk in shower drain unless the shower installation is less than about 10 years old. A few of these older shower drains (in concrete bases) are easy to remove but most are not. You can certainly go ahead and attempt it before tackling the shower base removal, but don’t waste too much time on it. After the base has been smashed to bits the drain assembly (and the liner it’s connected to) will be exposed and much easier to remove. Cut the liner out of the way to expose the drain pipe. I would suggest at this point that you check if you can access the drain coupling that is beneath the shower drain. These couplings are almost always rubber banded couplings (or Mechanical Joint couplings). There are hex screws on these couplings so the pipe can be easily removed with a socket wrench of some kind. If there is access, I usually detach the top section of drain pipe connected to the shower base drain. That way you can replace it with the exact size piece you need when installing the new drain. Otherwise you are stuck with cutting the existing drain pipe. This is very difficult and awkward especially if it’s cast iron. The remaining section will likely be too small for the new shower base drain as well. If this is a cast iron section of pipe, you should plan on replacing it with plastic ABS pipe instead. It’s much easier to work with, compatible with solvent welded drain assemblies, and very strong. At this point you can cut away the rest of the rubber liner. It will likely be attached under the wall tile for about 8″ – 12″ above the floor. This would be good time to turn of the water supply to the shower or if that’s not possible, to the entire bathroom. Very often this is also not possible without shutting off the water to all or part of your home. If this is the case, you will have to be extra careful when demolishing the valve wall. With the tub protected or removed (or shower base), you can then proceed to remove the shower fixture trims. If the water supply has not been shut off, you’ll have to be extra careful during this step. The most common type of tub spout has a Allen head set screw on the underside of the spout next to the wall. The spout can be removed by loosening this set screw (with Allen key) and sliding the spout straight out from the wall. Often there is a bead of silicon sealing it to the tile. If present, you will have to cut this away with a utility knife before you can remove the spout. The valve assembly trim can usually be removed by first removing the water control levers (hot and cold) or the single control lever. This can usually be accomplished in one of two common ways. The first way is by prying off the H or C caps of the control lever(s), then unscrew the levers by the center screw that fixes the lever to the valve body. If the water supply is still turned on, you must be very careful to keep the lever from moving while unscrewing the set screw. You WILL turn on the water if you allow this lever to turn. After these levers are removed, the rest of the trim removal is usually quite straightforward. There may be two obvious screws on the face of the trim that you can remove. Alternately, there may be a ring at the base of the water supply control(s) (where the levers were attached). This ring holds the trim against the wall and can simply be unscrewed. This should release the trim from the valve body. There may also be a bead of silicon that you must cut away before the trim separates from the wall. And finally, if it is a standard shower head, it can simply be screwed off. The shower arm can also be unscrewed from threaded shower head coupling inside the wall. You can use channel lock pliers or Vice Grips for this if you don’t want to retain the shower arm for future use. If you do, you’ll have to use a strap wrench to remove it, so you don’t damage the finish. It’s a good idea to leave this step until last, just in case you accidentally turn on the water during valve trim removal. The water then pours over you rather that into the stud wall cavity behind the tile. The tile demolition stage is next, but first I’d like to provide you with some important advice about demolition and construction dust control. The bathroom demolition stage is EXTREMELY dusty. Construction dust can also be a problem throughout the entire shower remodel. As such, I have a suggestion to largely prevent the dust from migrating into the hallway and/ or other rooms in your home during the demo and construction stages of your shower remodel. The easiest way to accomplish this is to create a dust suppression system using your regular (ceiling mounted) bathroom exhaust fan, if you have one. 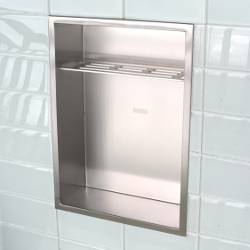 No matter how lame your old bathroom exhaust fan may be, you can easily and effectively eliminate dust from getting through the bathroom door and into your home. To use this construction dust control strategy effectively, you will have to keep the bathroom door closed or just slightly ajar so that air can move into the room while the fan is on. If there is a window in the bathroom, it should remain CLOSED during any dusty work in the room. You also need to make sure that there is a fresh air supply outside of the bathroom to supply the bathroom fan with a continuous flow of air (leave a window open in the living room, for example). This may seem confusing but it is all about the physics of air flow. To verify that it’s working as described, you can (and you should) verify that air is blowing into the bathroom under the bathroom door, before you proceed with any dusty work. This dust suppression strategy assumes that you will be replacing this fan later down the road when the dustiest part of the remodel is complete. The bearings in the fan motor really take a beating if you use this dust control strategy so I don’t recommend it unless you plan to replace the fan. If your bathroom doesn’t contain an exhaust fan (it really should), or you don’t plan to replace it later, you will have to use a different tactic to control the demo dust. In this case I would suggest buying a small cheap exhaust fan and mount it into an open window in the bathroom. You will have to do a good job sealing around this fan and the window opening to ensure that air will not enter the room from gaps around the fan. This can be accomplished by cutting out a shroud of plastic to cover the open section of the window completely. Use lots of masking tape around it’s perimeter to make sure it is fully sealed. Then you simply cut a hole in the middle of the plastic for the fan blade section and apply masking tape all around to keep air from coming in around the fan. Remember that the only purpose of this assembly is to suppress the dust by forcing air out of the room. You want the air coming in from under the bathroom door to be it’s most significant source – Air in (under door), air out (via window or exhaust fan). Simple, right? There are also ways that you can accomplish this if there is no exhaust fan or window in the bathroom. You can rig up a system of your own by placing a fan in an open doorway or window somewhere in the house. This fan would be sealed into the door opening so no air can escape around it. The fan would then be connected to the bathroom via a large sealed round duct. The other end of the duct would be placed into the bathroom door opening, with a shroud around it so no air escapes around the duct. This creates the vacuum you need to vent the dust from the room. This is a complicated and risky strategy because all the dusty air will be travelling through your home via this duct before it escapes through the window or door. In this situation you must make certain that this system has no leaks whatsoever or you will be venting dusty air into your home instead of outside. Like I said, it’s a difficult and risky dust suppression strategy. You can rent these systems at most tool rental stores as well, if you don’t want to try it on your own. That would be my recommendation. Tile removal is one of the more tricky parts of the shower demo but there is a way to do it safely and in a relatively organized manner. When removing tile from the wall, it may seem intuitive to try to separate the tiles from the backer board, but it rarely works out well. I would still recommend you try it though. There is a chance that the tiling contractor did a crappy job and the tiles may be poorly adhered to the backer board. In this case you can just pop them off the wall with a pry bar. That would be ideal. In my experience it is usually a waste of your time and energy to try to remove the tiles from the backer if they seem well bonded. A better strategy is to remove the tile and backer board together. One strategy to accomplish this is with a angle grinder (and masonry wheel). This would allow you to remove the tile by cutting it into sections. Although it seems like an organized way to remove tile, the dust production from the grinding wheel is crazy and completely unmanageable. As such, I use a very different strategy to remove the wall tile. 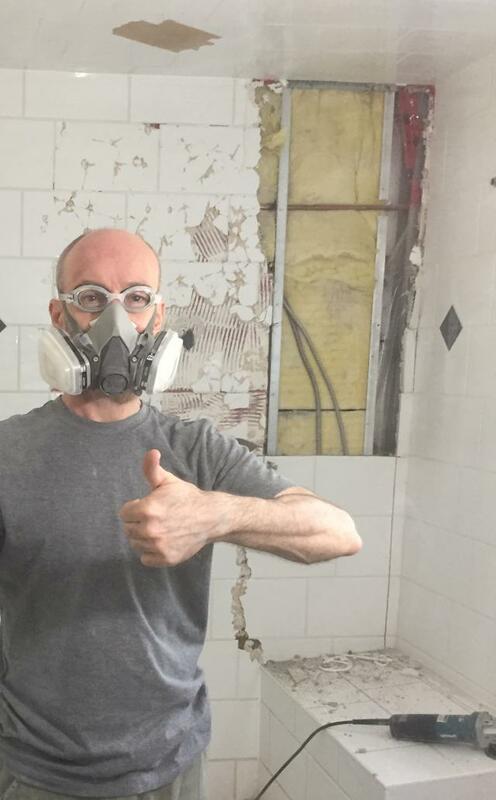 As you can see by the image….. I’m pretty happy that I just removed the first section of tile with a combination of my Smash technique and a little grinding. You can also see in the image, I smash a series of holes in the wall tile with a hammer between the wall studs so that both the tile and backer board collapse into the stud cavity. Crude, I know….. but effective. The goal is to smash holes like this from the ceiling to the floor vertically, and then horizontally to create a matrix of approximately 2′ square sections. I am not talking about a “Hulk Smash” kind of impact. You only hit hard enough to see the tile crack and then another to see it collapse slightly into the wall cavity. You don’t want to hit too hard because of the various utilities that will be running through the walls behind the tile. As you can see in the image, electrical wires and copper water lines are running behind the wall section I just removed…. Yikes! Electrical wires can probably handle a gentle hit with the hammer, but copper water supply pipes will not be so forgiving. So…. Proceed carefully! Just before removing the sections, you should try as best you can, to separate the tiled walls from the ceiling. If there is a bead of silicon you can simply cut it off. If there is a grout line, try to cut along the ceiling to separate it. If the ceiling drywall is still attached to the wall when the sections are removed, the facing paper of the drywall will tear away from the ceiling. You don’t need to create more drywall patching work for yourself. With proper construction grade gloves on, break away some of the broken tile in two locations around each of the sections to create holes big enough to get both hands in behind the backer board. With several rhythmic pulls of the sheet it will gradually loosen from the screws that hold it to the framing. You don’t need to pull very hard. Don’t try to get it off in the first pull. You will only herniate yourself. Before you know it you will have the piece in your hands, ready to bag it and dispose. At this point you should remove all the fasteners that remain connected to the walls. It’s worth while applying some extra effort on this task to make sure you don’t miss any of these fasteners. A nasty injury can result from even a single screw left in the wall, especially one that lost it’s head. If you don’t get them all, a very realistic possibility is …. Ouch! Lots of blood and a visit to the doctor to get stiches. A frustrating and unnecessary interruption to your project. Remove all the fasteners! That’s it for the tile demo! Not an easy, clean or fun job perhaps, but as organized and safe as it gets (in my opinion). If you didn’t protect your bathtub in an earlier step, and plan to junk it, now would be the time to do it. With all the tile, backer boards and fasteners off the walls, you can pry up the tub off the subfloor and try to remove it in one piece. Or…. You can use my preferred strategy, cutting the bathtub into manageable pieces. No need to herniate yourself wrestling the old tub out the bathroom, destroying furniture and drywall in your path. Using your reciprocation saw and a metal blade (if the tub is metal) or a regular demo blade (if the tub is acrylic / fiberglass) cut the tub into 3 or 4 pieces. 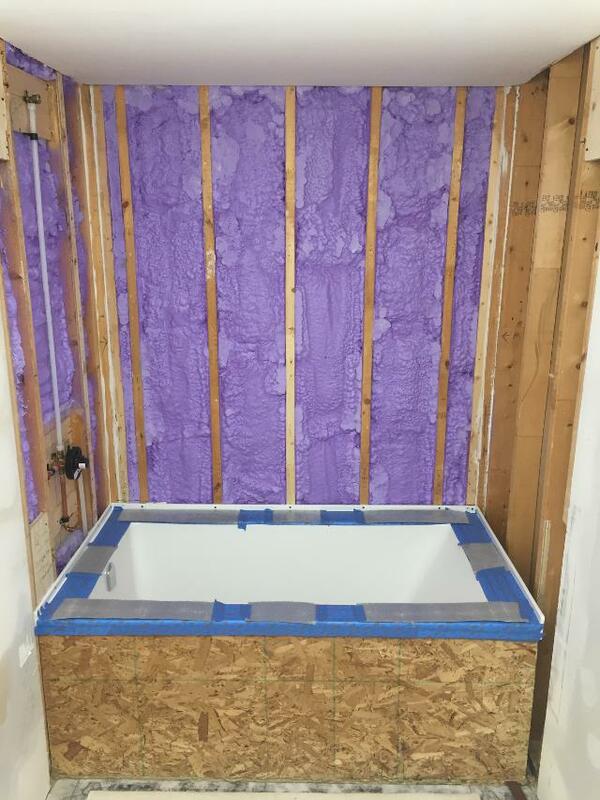 From about 1 1/2′ from the right or left wall, cut the tub from the top, down the front skirt first, then proceed with the back and the inside. Be very careful to watch where your blade is protruding and NEVER cut towards your body. You don’t want to injure yourself or damage any plumbing or electrical services. The goal is to slice the tub into 3 or 4 pieces that are easy to carry out and dispose of. If you don’t have a lot of experience with a reciprocating saw you may find that the blade will bind, causing the material to vibrate like crazy, creating huge amounts of noise while the blade goes nowhere. To solve this, you simply push the heal of the reciprocating saw firmly against the material. This stops the vibrating and the blade will start cutting beautifully again. My recommendation would be to ALWAYS remove and dispose of the vapor retarder plastic and insulation on any outside wall. Regardless, you must remove this material to assess the condition of the wall and framing, and it’s not worth reusing any of it. It may be difficult to detect moisture in the wall insulation so it’s best to replace it. The vapor barrier should also be replaced because it must be totally perforations free to function properly as a vapor retarder. You may not be able to determine whether the framing and wall have become moist from condensation or leaks, so it’s best to leave the area uncovered for a few days to let it completely dry. 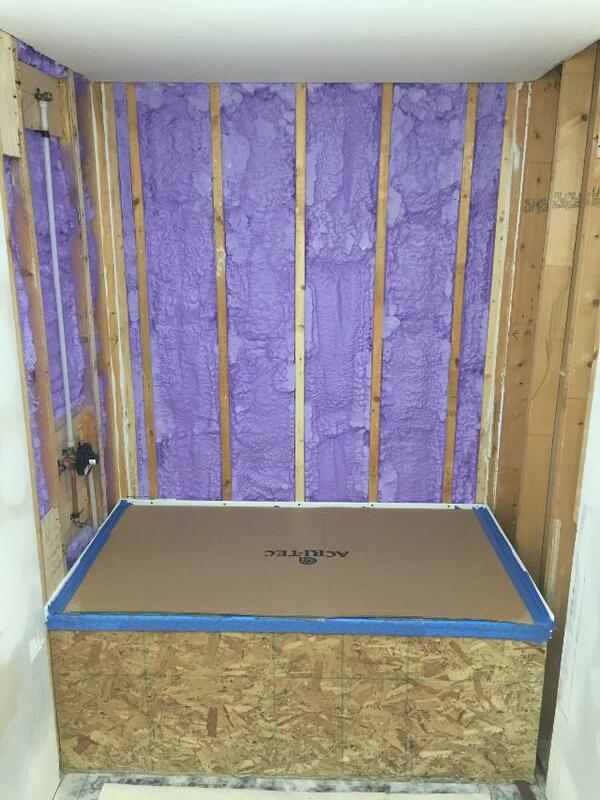 You can replace the insulation and plastic sheet when you start the rebuild. Of course if you see that the area is definitely wet, you should call a remediation contractor to remove any mold and thoroughly dry the area. You can also do this job yourself but make sure you do your research. You want to be certain that this area is completely clean (mold free) and dry before proceeding with the shower stall remodel. 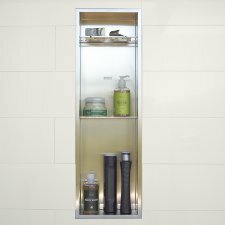 I would also recommend you read the Steam Shower section of my Shower Remodel Dangers post which covers some potential problems with outside wall waterproofing, especially in cold climates. I hope I have provided you with enough info to reduce your demolition stress and make the job run a little more smoothly. Please let me know in the comments below, if you have any of your own shower demo tips or if you have any questions or comments. I am always happy to hear from you! Get All Our Updates Including New Blog Posts, New Product Announcements, Promotions, etc. The ONLY Shower Niche with M-Block™ Waterproofing! INTRODUCING: The Redblock N828 Shower Niche!